Do you know what AIORT is? Apparently it's an Acronym for And, If, Or, Then. Which is the way that most of us create betting systems. 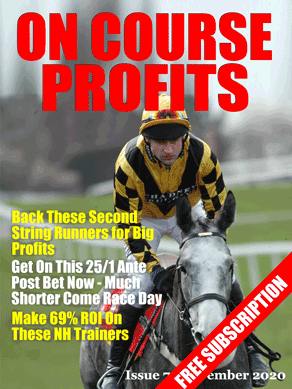 In the February On Course Profits magazine there is a very interesting article which explains why the way most people create betting systems doesn't work. And explains exactly how to build systems that are much more profitable. It makes for an interesting read and has certainly given me some food for thought. You can get On Course Profits for free on iOS and Android devices here http://oncourseprofits.com. If you don't have a suitable device you can also buy this edition on Amazon and read it on any device – Click Here. We have our first qualifiers for the First Time Headgear system that we posted earlier on the week. I'm not sure I'm ready to back these yet, maybe just very small stakes! You'll recall that we did the research on 2013 and 2014 data and that we then applied the rules to January 2015 and the results were excellent. So there has been some forward testing. By the way 20/1 selections have been profitable in the past, but obviously the strike rate is very low. There was a 25/1 winner on January 1st this year. Don't you just love it when you spend hours researching a system looking into an angle that you think will highlight some winners all for nothing. Or worse still when you research a system and you think you've found a micro system with a little pocket of profit and you set it up in Horse Race Base to notify you of future runners and a year later it's had just seven qualifying bets and all seven have lost. That's the results from a system I created last January and I've been waiting for some live results to prove it works before I write about it. Whats worse still is that Derek Miller has just released a laying system that uses a similar angle to make big profits from laying. It's not the same angle I was looking at, I was looking at French bred horses on one particular all weather course. Derek's system is selecting French breds in National Hunt races, but it does serve to remind me that there are profits in following horses that are bred for different environments and that I knew that but I didn't find the profit. The good news, for you, is that the system is free.